A space. Before going on maternity leave, let your employer know that you will need a place to pump upon your return. 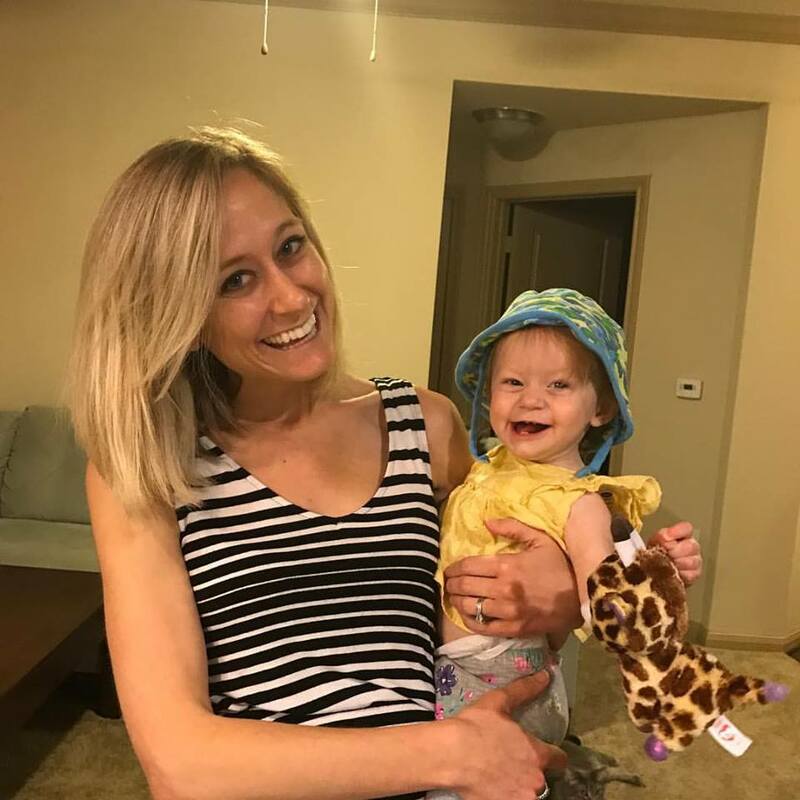 Having this conversation ahead of time will give you greater peace of mind going into maternity leave and will save you the hassle of trying to figure out it at the last minute. Employers covered by the Fair Labor Standards Act are required to provide break time for women to pump for up to one year after their child’s birth. They’re also required to provide “a place, other than a bathroom, that is shielded from view and free from intrusion from coworkers and the public,” according to Section 7 of the Fair Labor Standards Act. Sometimes, employers have rooms but not enough space to accommodate mothers at the times when they need to pump. If this is the case, see if there’s another room that you might be able to use. It might not have all the amenities that the designated pumping room does (i.e. a mini fridge, sink, couch, etc.) but at least you’ll be able to use it on your own time. All moms deserve a predictable, private, and comfortable place to pump. A pump (and ideally two). Friends often ask me which breast pump they should get. I’ve only used Medela’s Pump In Style, and I highly recommend it. I’m a big fan of Medela’s products and have found their pumps to be reliable and durable. I got this pump for free through my insurance company. Most Marketplace plans are required to provide breastfeeding equipment for pregnant and nursing women. I recommend calling your insurance company and ordering one a month or two before your due date because the pump can take a few weeks to arrive. If it’s not your first pregnancy and you already have a breast pump, order a second one. I did this when pregnant with my second baby and am so glad I did. Having two pumps means you don’t have to lug your pump to and from work every day. Pumping on the go isn’t ideal, but some days it’s the best option. I leave one pump in my car, along with a special car adapter. On days when I’m running late or have meetings during my typical pump times, I pump during my commute. I usually just drape a jacket over myself, and I keep my nursing cover in my car as an added alternative. Pumping while driving isn’t ideal, but it does save time and helps ensure that you don’t miss a pumping session. I also rely heavily on my hand-held Medela pump, which I use in the early mornings. It’s super efficient and a great option for when you need to pump quickly/on the go and don’t feel like setting up your electric pump. It’s also a great option if you’re running an event or a day of meetings and don’t think you’ll have easy access to your electric pump. It’s always comforting to know you have a backup. Two pairs of pump parts. Know where the nearest Target is in case you forget your pump parts or need new ones. I find it really helpful to have two pairs of pump parts. I use one pair during my morning pumping session and the second set during my midday pump. After the midday pump, I clean both sets of parts using these Medela wipes. Twenty four wipes come in a pack, so I only end up needing to buy one package (about $7) per month. I find it much easier to use the wipes as opposed to lugging my pump parts to the bathroom to clean them. Check the space where you’re pumping; it may have a sink, in which case you won’t need wipes. Extra membranes. Pump parts are pretty durable, but membranes – those little white pieces that attach to the valves – are known to rip from time to time. I always keep extra ones on hand at work, just in case. Pumping bras. When I pumped for my first child, I wore a special pumping bra that I would put on and take off every time I pumped. With my second child, I knew I needed something more practical. I bought a few Rumina bras, which act as regular bras and pumping bras, and I love them. They’re comfortable (no underwires) and they do a good job of holding the pump parts in place. I always use them with empty bottles; if you use bottles from a previous pump and they have milk in them, they’ll sag a bit in the bra and the suction won’t be as strong. A cooler pack with four bottles. I’m often spotted roaming the halls with my Medela cooler, which I use to transport and store my milk bottles. It’s not the most attractive thing to be carrying around, but it’s relatively discreet and serves its intended purpose. Extra milk storage bags. I keep a small stack of milk storage bags in the office where I pump in the off chance that a.) I pump a lot of milk and run out of space in the bottles that I pump into each day or b.) I have to stay at work late and need to fit in one additional pumping session. These scenarios are rare, but I’m the type of person who likes knowing I have a backup. In general, I try not to make work calls while pumping so that I don’t have to run into awkward encounters like this. If you need to make a call while pumping and you’re worried about the noise, put a pillow over the pump to muffle the sound. Companies that manufacture breast pumps are working to create quieter pumps, and some already have. If the noise of the pump is an issue for you, look into some of the newer, quieter ones. A sign. Some women have to pump in rooms that don’t have locks, or that multiple people have access to. If that’s the case (and even if it’s not), put a sign outside the pumping room door. I have a simple handwritten sign that says “Room in use,” and I put it on the door every time I pump. I’ve seen some pretty creative signs online and from friends, so switch it up with a more direct message if you want or think it’s necessary. If your room doesn’t have a lock, see if it’s possible to get one. Snacks & lots of water. As soon as you start pumping, you’ll likely feel thirsty. Drink throughout the day and have extra snacks on hand to eat in between meals. Research has shown that pumping and breastfeeding consume about 25% of your body’s energy and burns several hundred calories per day (about 20 calories per ounce of breast milk), depending on how much milk you’re producing. It’s no wonder I’m always hungry! You need rest, too, to keep up your supply. But let’s be honest; sleep is pretty hard to come by with little one(s) at home. My son has been waking up multiple times a night to eat, meaning I get very little sleep these days and am always tired. Since I can’t control how much sleep I’m getting, I can at least try to control what I eat. An extra shirt. At some point while you’re pumping, you’re bound to spill milk on yourself. Keep an extra cami or shirt at work for the day when this will inevitably happen. Doing so has saved me in the past. A sterilizer. Every night, I transfer my pumped milk into bottles for my son’s next-day feedings. I always pack one extra bottle, in the off chance that one of his bottles gets knocked over at daycare or I’m stuck at work late and can’t make it to daycare in time for his 5:30 p.m. feeding. (I’m fortunate to have a good enough supply to be able to pack an extra bottle each day, but realize it’s not a possibility for everyone). After I get my son’s bottles ready, I sterilize my pump parts and the pumping bottles using this Munckin sterilizer. (These sterilizing bags are another good option if you’re on the go.) Afterward, I put the clean parts in a Ziploc bag and the bottles in my cooler bag so that I don’t have to worry about doing it in the morning. This can get time-consuming, so ask for help. Your partner (or friend or family member) may not be able to make milk, but they can certainly help you fill and clean milk bottles! Mentally plan out your pumping sessions for the day and do your best to protect those times. I’m transparent about the fact that I pump. It’s not something I talk about all the time, but I have no shame in letting colleagues know what I’m doing. I always work while I pump, but if your supply is low, and/or you find yourself getting anxious, try to relax by looking at photos of your little one. Make sure you’ve been clear with your childcare provider about how you want your baby to be fed. Before returning to work, I gave my son’s daycare teachers specific instructions on when to feed him and how much. I like to be able to breastfeed my son at the end of the workday, so I spread out his feedings accordingly. Some moms prefer to have their baby fed at the end of the day so that it’s one less thing they have to worry about when they get home. It’s all a matter of preference. What works for you early on may not work a few months later, so allow yourself to be flexible. My mini checklist, which I try to look at every time I leave the house in the mornings. Put a checklist by the door so that you won’t forget anything (pump parts, bottles, cooler bag, etc.) 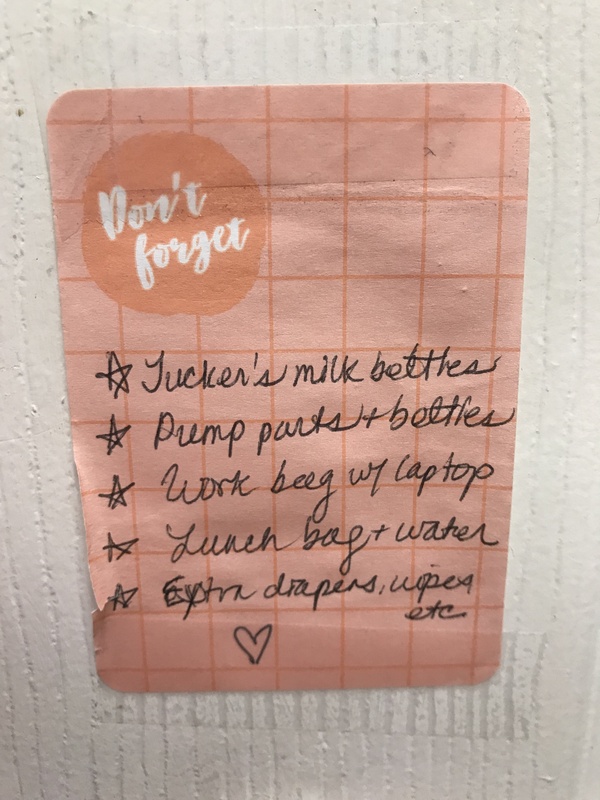 I taped a checklist on the door when I first returned to work and found it super helpful, especially on days when I was frazzled and therefore forgetful. I don’t really need to look at it anymore, but I still like knowing it’s there. Write yourself little pick-me-up notes. Before my first day back at work, I wrote myself an empowering note to help me get through my first week back. Be gentle with yourself. Some days, you will feel like a total rockstar. Other days, you may feel defeated, alone, and even more exhausted than usual. It’s hard for anyone to fully grasp the challenges of being a working/pumping mom unless you’ve been through that experience yourself. Find a friend or confidante who you can turn to on days when you need to vent, cry, or laugh about the crazy/beautiful/messy aspects of life as a working mom. I have multiple photos of my kiddos on my desk. Seeing them throughout the day helps keep me grounded, especially on days when work/life “balance” seems totally out of whack. Reassess along the way. 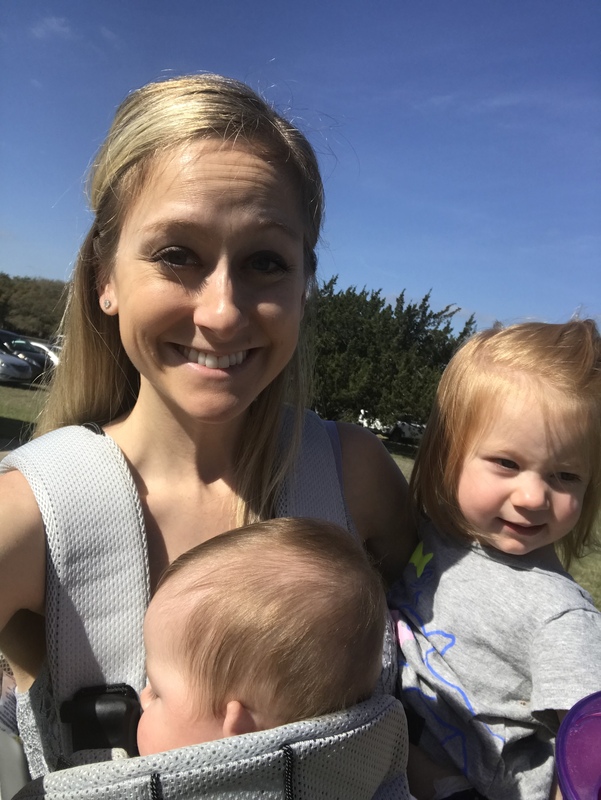 Yes, “breast is best” when it comes to feeding your baby, but it’s not the best option if breastfeeding and/or pumping are completely stressing you out, or if you’re struggling to find the time to pump. If pumping three times a day at work is too difficult, consider pumping at other times – maybe once in the early morning, once at work, and once at night, provided it doesn’t interfere too much with your supply. Seek encouragement from other moms who have been in your position and make a decision about what’s ultimately best for you and your baby. Celebrate yourself. Strike a power pose while pumping and remind yourself that you’re awesome for making it all work — and for keeping your baby well-nourished and loved. When it comes to breastfeeding and pumping, food is love. 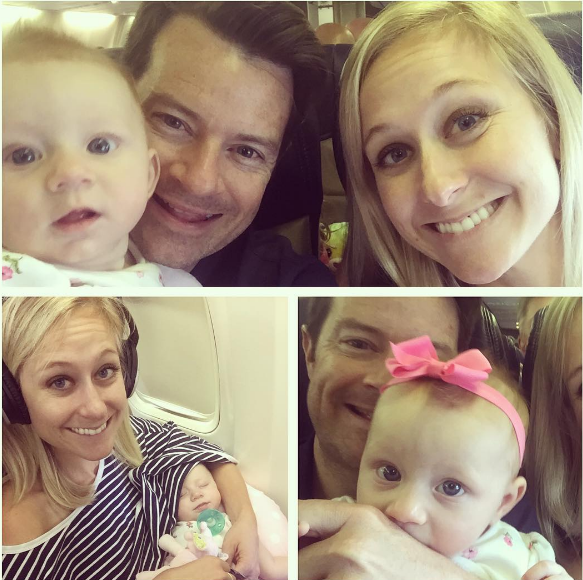 Traveling has taken on a new layer of complexity now that I’m a mom. For months leading up to my first work trip, I pumped every day and night so that Madelyn would have enough milk while I was away. 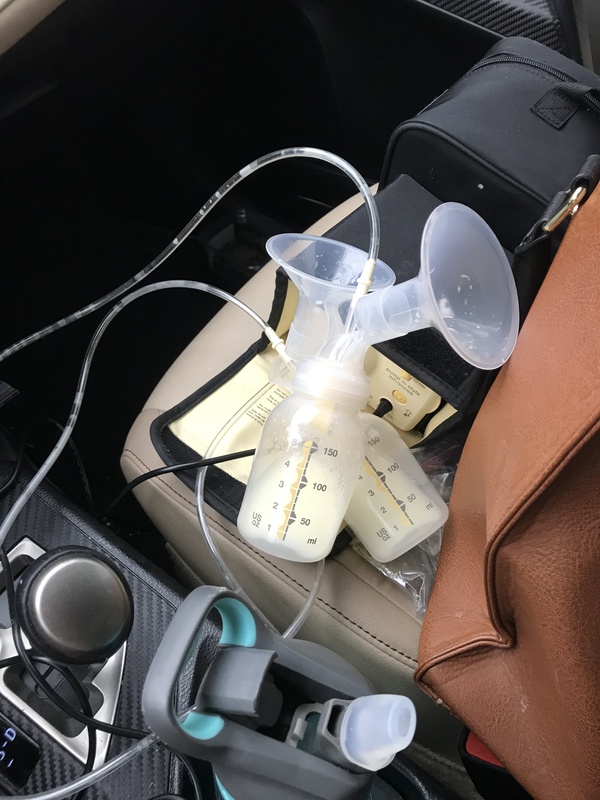 I know this isn’t realistic for everyone; some breastfeeding moms may not have the time or ability to pump that much, and some moms may (understandably) not want to. Others may decide to stop breastfeeding altogether before going on a trip to avoid having to pump or maintain their supply. Keeping up your supply when traveling can be difficult, but I’ve learned a lot over the past month to make it easier. 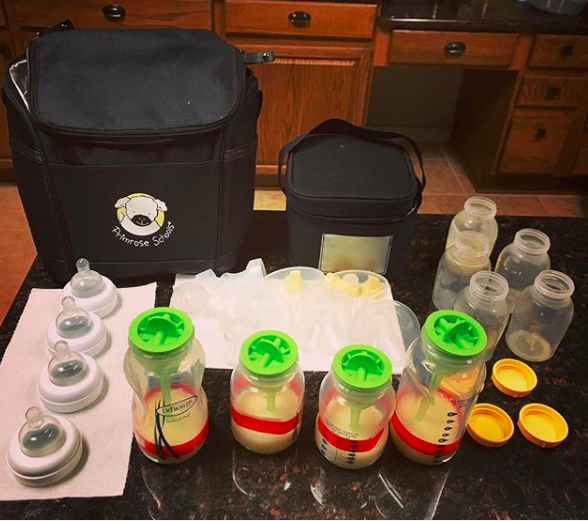 Based on tips from friends and my own experiences, I’ve put together a checklist and related pointers for traveling moms who want to pump and preserve their milk. If you have additional tips, please let me know or share them in the comment section. Breast pump parts, plus bottles for milk storage. I typically pack four bottles per trip so that I have enough bottles to pump milk into. 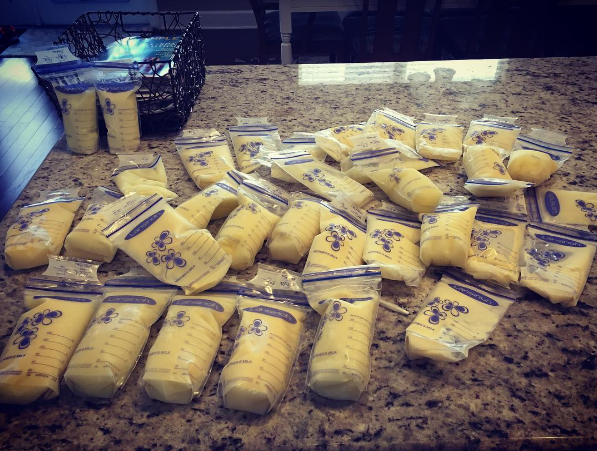 Some moms prefer “pumping and dumping” to avoid the hassle of having to travel with milk. I never liked the idea of throwing my milk away, so I try my best to preserve it. A small cooler with an ice pack. This Medela cooler bag holds four bottles and comes with an icepack that’s specially designed to keep the bottles cold for up to 12 hours. I use the small cooler bag to store milk on travel days, or when I don’t have easy access to a refrigerator or freezer. If you’re checking luggage, put the cooler bag and ice packs in your checked luggage and carry on the smaller Medela cooler bag. TSA will test your liquid milk, but they don’t open the bottle or put anything in the milk during this process. If you’re only bringing carry-on luggage, make sure the ice packs in the coolers are all frozen. If they’re not, TSA will likely confiscate them. Before you leave on your trip, put a small bottle of milk, or a bag of frozen milk, in the big cooler with the ice packs. This way, there won’t be any question as to why you’re bringing frozen ice packs onto the plane. Before you go on your trip, take a look at this webpage, which outlines TSA guidelines for traveling with breast milk and formula. I always keep it pulled up on my phone so that I can refer to it if need be. I’ve been to eight different airports in the past month and fortunately haven’t run into any issues with TSA agents. A family pic from our trip to Texas to visit family. Troy’s been a Super Dad when I’ve been away! Breast pump cleaning wipes and a disposable micro-steam bag. At home, I clean my breast pump parts in a microwave-safe sterilizer. While traveling, I use these quick clean wipes, or soap and water. (I try to avoid soaps that have a lot of scent; sometimes the scent stays in the bottle and alters the taste of the milk.) If you have access to a microwave (some hotel rooms have them), you can use a disposable micro-steam bag. These Medela bags can be used up to 20 times. Gallon-size plastic bags. I typically pack about half a dozen Ziploc bags to store both clean and dirty breast pump parts. Inevitably, there are times when I don’t have time to clean the parts – usually because I’m running off to my next meeting or I’m trying to catch a flight – so I stick them in one of the Ziploc bags. A nursing cover. I always keep my nursing cover in my carry-on bag in case I need to use it while on the plane. I try to time my pumping sessions to where I don’t have to pump on the plane. If I don’t have another option, I either pump from my seat or the airplane bathroom. I tend to pump from my seat — with my nursing cover — if there’s a long bathroom line or if I’m engorged and the fasten seatbelt sign is on for an extended period of time. A hands-free pumping bra/apparatus. I bought this $10 one off Amazon after a friend recommended it. It’s lightweight and compact, so it’s perfect for traveling. I wear it every time I use my electric pump so that I can multitask while pumping. Photos of your baby & relaxing music. I often look at pictures of my Madelyn when pumping to help boost my supply. Studies show that looking at photos of your child and listening to relaxing music can significantly increase your milk output and even the fat content. Avoiding stress and finding time to relax is also important, though easier said than done when traveling for work. Setting expectations ahead of time – for yourself and others — helps. During one of my recent trips, I had to pump every two-and-a-half to three hours while running a four-day work event and board meeting. I prepped my colleagues ahead of time so that they wouldn’t question why I was stepping out every few hours. Doing so made me feel more relaxed when pumping. Bottled water and snacks. As a vegetarian, I often have trouble finding adequate protein sources while traveling. If I don’t eat enough protein, or enough food in general, my milk supply drops. To avoid this, I’ve started packing a water bottle and extra snacks — almonds, Kind bars, raisins, etc. Change of clothes. Let’s face it; pumping isn’t always graceful. There have been plenty of times when I’ve admittedly gotten milk on my outfits while pumping. If you spill milk on yourself and your clothes end up appearing wet or smelling like sour milk, it’s comforting to know you have a backup outfit! When you get home from your trip, first give yourself (and your little one) a big hug. You did it! Pumping while traveling takes courage and commitment. It can be awkward, uncomfortable, and super inconvenient. But keep reminding yourself why you’re doing it – to provide nourishment for your little one. When it comes to feeding babies, food is love.